In the river of human history, in every generation the Artist belongs to a special niche of fantasy and creativity. Their poetic creation and expression enriches the human spirit, adding richness, wisdom, and color to our history. In our time, how can we give artists an environment for creation and the young generation a platform to show their talent? This was the beginning concept for the Zhou B Art Center. Since 2004, the Art Center has grown and developed and those ten years passed suddenly. The desire and idea to build the Art Center is still a fresh memory that burns in our minds. Today we celebrate ten years of innovation. We established ourselves first as artists in Chinese Contemporary Art movement. In 1986 we came to the United States, participating in shows in Chicago and relocating our practice to Bridgeport. In the early 90’s, we finished our fourth major museum traveling show in Europe and in 1996 we accepted a professorship in the Hamburg International Academy of Art and Design. During the following years we taught and lectured at the London International Art Academy (England), Salzburg International Summer Academy (Austria), Traunkirchen Summer Academy (Austria), and Kunstakademie Bad Reichenhall (Germany). This allowed us to transport our teaching philosophy and concept of Feelingism, “Feeling is Liberty,” to students and audiences throughout Europe. Over nearly 20 years we have had thousands of students from all over the world. Using our Feelingism philosophy, these young artists continue to pursue their artistic dreams and are passionate about developing their own artistic styles. At this point in our artistic journey we realized how important it was to create an environment for artists to gather and foster each other’s creativity. This kind of special atmosphere seemed like a rare commodity in a world where commercial developers make many areas in modern cities too expensive for artist communities to thrive. We imagined an environment created and kept solely for artists and decided this would be our dream. One day we realized we truly had the ability and belief to construct this environment and realize their dream. Created in our hearts to protect the greatness and holiness of art, the Art Center became the Zhou B Art Center. We hope in history we are able to create a home for artists and paradise for creation. In 2004 we purchased a 87,000 sq. ft. building in Bridgeport, designing and creating until reaching the international art recognition the Center has today. The center has gone through three different stages of growth. First, starting from a primitive a simple condition, the first group of artists believed strongly in the vision of the Center. Second, the Center built a strong goal and mission to bring in many international artists, developing and improving the condition of the Center. Third, the Center established a reputation for curating high quality exhibitions for artists and their work. With at least ten exhibitions a year, the Art Center has hosted and curated over 160 major exhibitions in the past ten years. 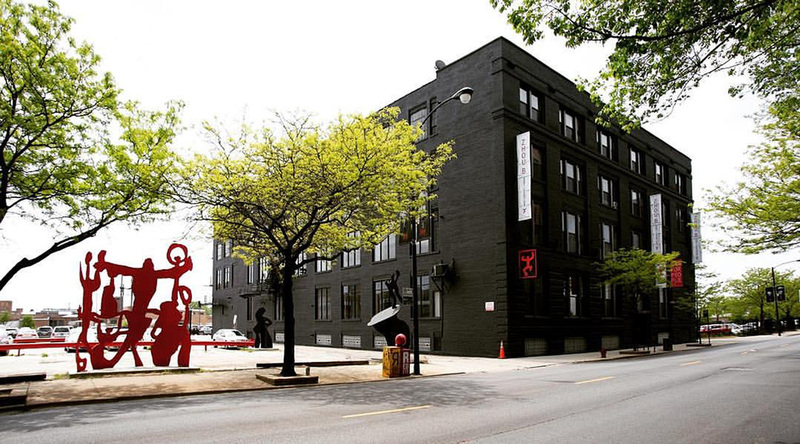 The Art Center houses more than 50 artist residencies, including international artists, with a wide variety of mediums represented. The 3rd Friday Openings at the Center are some of the special destinations for artists and art lovers in the city of Chicago. In the last ten years the Center developed with hundreds of artists coming together to build the Center up and give it international influence. We appreciate all of the support from friends, institutions and, most importantly, the Artists. We hope this Art Center will continue to develop and grow 20, 30, 40 years and into the future. During this great moment of celebration we are beginning another great vision and fantasy: The Zhou B Art Center will be developing in the great capital of China, Beijing. In the future Chicago and Beijing will have a great alliance through the Zhou B Art Center providing the greatest platform for international artists. We have to especially thank Oscar Friedl, the former Director of the Center; Sergio Gomez, Curator and Director of Exhibitions; Donna Bliss, Vice President of Creative Development, and all the Zhou B staff for all of their tireless work, passion, commitment, and contribution. We would like to especially thank Michael Zhou, Executive Director of the Zhou B Art Center. Since graduating college, all of his time and talent has gone into believing and supporting the dream of his father and uncle. Art will belong to our future and people.